"The world remains as it is. It is said that the world is not perfect. In one sense, we feel sorry about this, but thinking deeper we realize that had the world not been what it is, the charm would have been lost. There is joy because there has been untold suffering. If death were not there, life would be a perfect misery to anyone after some time. Moreover, there would not be accommodation for all on this globe. Death, however painful it may be, is essential and adds beauty to life. Things which appear to be bad at the outset may prove to be good in the long run. They can be beneficial to the society." The website has been started on Rashtra Chintan Diwas, a First day of Samartha Bharat Parva, and till now 15,35,784 Suryanamskars have been registered. Vivekananda Kendra, Tinsukia branch organized one multi-speciality medical camp in Rajgarh Ali Tea Estate of Tinsukia district of Assam on 16th August. 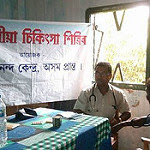 A team of four doctors and paramedical staffs rendered their service to the tea tribes of the area and nearby villages. Total 541 patients were examined in the day long camp and free medicines were distributed accordingly. Before the camp an awareness meeting was also conducted, mainly on nutritional deficiencies. Dr.S.D.Singh, a physiotherapist from Tinsukia delivered a lecture on calcium and vitamin deficiency. A talk was delivered on Iodine Deficiency also. Dr.Prema from Mumbai also talked with the female patients and guided them on Anemia and other health issues. The local unit of All Adivasi Student Union volunteered the team. Independence Day - 15 August 2015 was celebrated in a grand manner in our school campus.The Chief Guest Brahma kumar Heddan Bhrama Kumarikal Organization, Vallioor Branch hoisted the National flag. Brother Brahma Kumar Velu Bhrama Kumarikal Organization was the special guest. Students from all the level participated in Band Display. Students made the celebration a grand one by presenting different programmes as Bharathanatyam, different kinds of exercises, Yoga, Karate, Hoops, and Pyramid. Speeches about freedom in Tamil and English were delivered by the Students. Inspiring speeches were given by our honourable guests and they awarded prizes to the students who scored more than 90% marks during the last academic year. After the celebration, sweets were distributed to students and parents. Our School correspondent Shri. S.K. 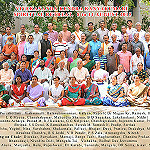 Subramanian arranged the function in a grand one. Vivekananda Kendra organized a Spiritual Retreat from 8th to 14th August 2015. 61 people participated from 11 states named Tamilnadu, Kerala, Karnataka, Andhra, Odisha, West Bengal, Assam, Uttar Pradesh, Rajasthan, Gujarat and Maharashtra. All Participants were divided in to 6 ganas named Nyaya, Vaisheshik, Saankhya, Yog, Mimansa and Vedanta, in which sisters in two ganas and brothers four. The medium of the Shibir was Hindi. Daily routine started with wake at 4.30 a m and ended with light off at 10.00 p m. Sessions in between were prathasmaran, Gita Pathan, Loosening exercises, simple Aasanas, Surya Namaskar, Pranayama, Shram Samskar, Lecture sessions, Group discussion, Songs and Chanting Practice, Omkar Dhyan, Cyclic Meditation, In tune with Nature, Bhajan Sandhya and Aananda Mela. Subjects for the lecture sessions were Concept of Spirituality, Purposeful Life, Kendra Prarthana, Story of Vivekananda Rock Memorial, Karma Yoga, Bhagavad Gita, Swami Vivekananda, V K- a Thought Movement, Kendra Activities and Shri Shankaracharya. Group discussions were on selected chapters from Sadhana of Service and Rousing call to the Hindu Nation. They also visited the Exhibitions and Vivekananda Rock Memorial. Videos on VKV Tafrogam, Construction of Vivekananda Rock Memorial, Prime Minister’s speech on the occasion of MEJSP Inauguration and Eknathji were also shown. In Geet Abhyas, songs on Ma. Eknathji, mantras, slokas and patriotic songs were practiced. Incidents from the life of Ma. Eknathji, games or video show, Hanuman Chalisa and Aatmaavalokan were in Aanandamela. In Samapan Satra, Ma. Balakrishnanji gave udbodhan on Thyaga and Seva and asked all the participants to associate with Vivekananda Kendra and its activities. Shibir concluded with Kendra Prayer. "If Atmano Mokshartham Jagat Hitayacha is the ideal, then let there be at least a few men who live that ideal, who breathe that ideal every moment of their life. So this special characteristic that we start with such people, first we create whatever is the ideal of the mission, of an organization. Those ideals we live, that will be reflected in our life. All the principles that you expound as the principles of the organization, those principles must be embodied in the life. At least few persons, few souls must be like this. Once you have that band of workers then you can have a specimen, you can tell to the people, yes these are the specimens.Such people we want to build. This is our concept of man making. These are the men who represent the organization." The website has been started on Rashtra Chintan Diwas, a First day of Samartha Bharat Parva, and till now 15,29,652Suryanamskars have been registered.